2 E(spl) Proteins—Where Did They All Come From? 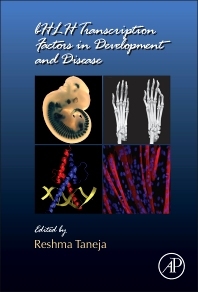 This new volume of Current Topics in Developmental Biology provides a comprehensive set of reviews on bHLH transcription factors. bHLH factors are vastly recognized for their diverse roles in developmental processes and their dysfunction underlies various human pathologies. Each chapter is authoritatively written by a leading expert in the field and discusses every possible aspect of this huge and diverse field. Researchers in cell, developmental, and molecular biology and in genetics. Reshma Taneja obtained her Ph.D. at Indian Institute of Science in Bangalore working on gene transcription under the supervision of Professor KP Gopinathan. During the course of her postdoctoral training in Prof Pierre Chambon’s laboratory at the IGBMC in France she started working on a bHLH transcription factor Stra13, which was identified as a retinoic target gene. Her own laboratory initially at the Mount Sinai School of Medicine in New York, and currently at the National University of Singapore has had a long–standing interest in bHLH proteins and their ability to regulate cellular differentiation programs. Her group has made ground-breaking discoveries including generating Stra13-/- mice which first revealed its function in homeostasis of the immune system, as well as in skeletal muscle biology. In addition, her laboratory has identified novel transcriptional repression mechanisms mediated by recruitment of chromatin modifying enzymes that impact the function of bHLH factors in cellular differentiation. Currently, she holds an appointment at the Department of Physiology at the National University of Singapore and an adjunct appointment at the Mount Sinai School of Medicine. Her work has been well funded over the years from major funding bodies including the National Institutes of Health, The Muscular Dystrophy Association, March of Dimes Birth Defects Foundation, The Leukemia and Lymphoma Society, Lupus Research Foundation in the USA; and from National Medical Research Council, Singapore Stem Cell Consortium, and Ministry of Education in Singapore. She has won several honors and awards including the prestigious Scholar Award from the Leukemia and Lymphoma society. She serves as reviewer for several international funding agencies including NIH, NSF, NSERC Canada, Research Grants Council Hong Kong, Israel Science Foundation, Telethon, Association Française contre les Myopathies, French National Research Agency, and the National Medical Research Council Singapore. She is currently on the editorial board of PLoS ONE, Differentiation, and Open Journal of Genetics.